It is rare to see siblings working together in their chosen profession, let alone flying a commercial aircraft together. That’s exactly what brothers, Captains John and Maurice Rondeau did recently when they flew Air Niugini flight PX 008/009 from Port Moresby to Hong Kong and back. The Rondeau brothers from Barok area of Namatanai, New Ireland Province are both Captains on Air Niugini’s Boeing 767 fleet. Captain Maurice Rondeau, the younger sibling is a Training Captain on the Boeing 767 aircraft. 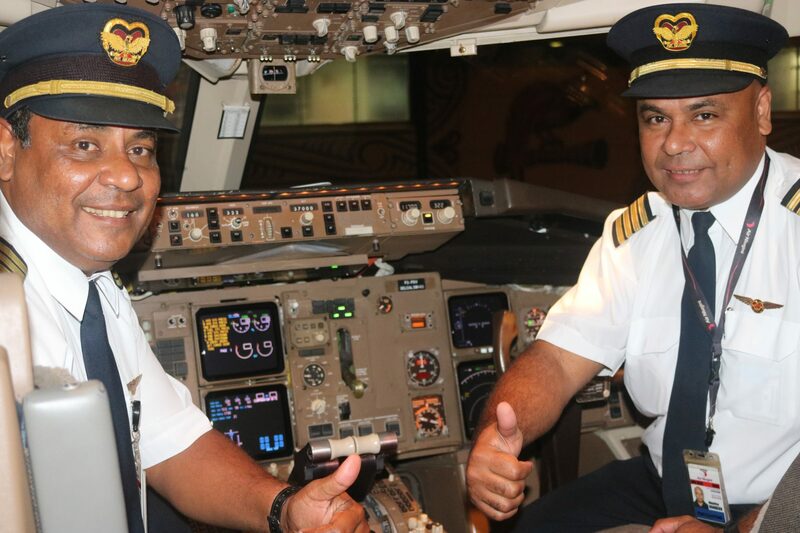 He and Air Niugini’s other Training Captains are responsible for the training of the airline’s pilots undergoing evaluation on the Boeing 767 aircraft while his older sibling has been promoted recently from the B737 aircraft to now flying the B767. “Yes, we are brothers and also colleagues. We always maintain professionalism when flying together as we do with other pilots. We are very loyal to Air Niugini, hence we are still here.” said Captain Maurice Rondeau with a big smile. Captain John Rondeau has worked with Air Niugini for almost 23 years, having commenced in November 1995, whilst his younger sibling joined five years later in 2000. So far, they have operated three flights together, initially to Narita airport, Japan four years ago, followed by another to Brisbane, Australia and the recent flight from Port Moresby to Hong Kong and back. The other sibling pilots working for Air Niugini are Captains Lawrence Koyama (B767) and Captain Hillary Koyama (Fokker), Captain Barry Casupang (Fokker) and Captain Andrew Casupang (Dash 8), First Officer Rhoda Ilave (Fokker) and First Officer Steven Ilave (Captain under training on the Dash 8) and Captain Elijah Kiromat (Fokker) and First Officer Patrick Kiromat (Fokker). Air Niugini’s Acting Chief Executive Officer, Mr Tahawar Durrani said these are rare achievements, something everyone including Air Niugini is proud of.